House of Puddles (HOP) is a final refuge for homeless senior basset hounds. We are a 501(c)(3) charity. Our mission is to provide a safe, loving, comfortable home for unwanted, unadoptable bassets who would otherwise be euthanized because they have no place else to go. We care for the senior bassets for the rest of their lives, providing for all their needs, including veterinary care, medications, food, nutritional supplements, grooming and any other special needs they might have. All the senior bassets (and one neurotic middle-aged coonhound) live in the home with Marilyn Brazzle, HOP founder, just like any well-loved pet. They sleep on her bed, on the couch, or anywhere else they feel comfortable. They have free access to a large, fenced in yard via their own doggie door. There are no kennels. 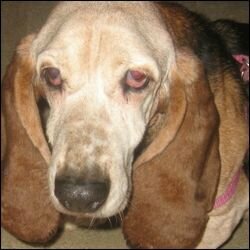 Most bassets come to us at the request of other basset hound rescue organizations. They often cannot or will not rescue senior hounds because it is not likely they will ever be adopted and they take up space in foster homes needed for the younger, adoptable hounds. We have accepted basset hounds from states throughout the Mid-Atlantic, South and Mid-West regions. To see these wonderful, comical old hounds in action, visit the HOP Youtube Channel. You can also subscribe to our newsletter, LOLHOP, for news, fundraising events, and a lot of laughs. And if you can, please make a tax deductible donatation. It is only through the generosity of others that these senior dogs have a home. Follow House of Puddles on Twitter at @HouseOfPuddles. We love House of Puddles! Marilyn is our hero!